Matcon supply a range of Intermediate Bulk Container (IBC) system solutions designed with Lean manufacturing in mind. The product offering is tailored to meet the demands of your particular application; which might include the need to accommodate varying order sizes, a widening of product portfolios and increasingly stringent regulations. We can supply a fully integrated system from Formulation to Packing, or integrate individual items depending on your specific business needs. As all the modules are stand-alone they can easily be expanded as demand grows. Each one is fully factory-tested prior to supply for a low-risk installation. Please take the opportunity to visit your industry page where you will find Case Studies and Articles relating to your industry. The IBC container is at the centre of the Matcon powder handling system. Designed to be filled and emptied quickly, with washing off-line, the IBC container enables all the manufacturing processes to happen simultaneously for optimum production efficiency. With the unique Matcon Cone Valve technology inside each one, our IBCs offer controlled discharge and protection against product segregation. Transporting material safely between the manufacturing process steps without the risk of contamination entering the IBC container. 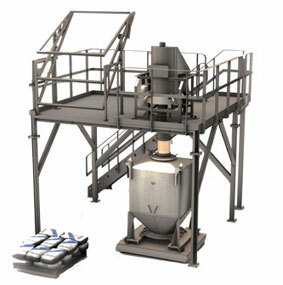 Dust-free transfer of product from the IBC container to the downstream process equipment. Overcoming powder handling issues due to the unique Cone Valve technology within each IBC container. Protecting mixed blends against product segregation. Easy handling as the IBC container can be moved by a variety of handling trucks, forklifts or AGVs. The Matcon IBC container is available in a range of sizes from 500L to 3500L, but smaller or larger sizes are available on request. In addition to the �S Series� stainless steel IBCs, we also supply a range of polyethylene IBCs. If you would like further information on this range, please do contact us. For pilot scale production why not use the SmartDrum IBC container system which offers all the benefits of the larger IBCs but for volumes of 150L-450L. There are various ancillary pieces of equipment that are used alongside the Matcon Product modules and Matcon IBCs. Click here to see these IBC Components. Commonly known as a bag dump station, the Sack Tip Module provides a simple means for filling Matcon IBCs off-line, decoupled from the manufacturing process flow. Fully contained transfer of material from the bag dump station to the IBC, reducing the occurrence of spilt or wasted material. High standards of hygiene with dust control in mind. Ease of cleaning, with easy to strip & clean bag dump station parts, which can be supplied as additional parts for rapid changeovers and cleaning off-line. Increased product safety and quality with the use of the flatbed vibratory sieve and magnetic grate in the bag dump station inlet to catch 'tramp' material. 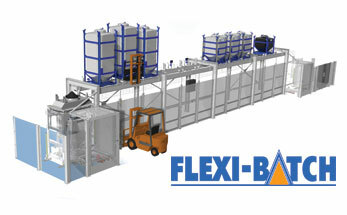 The Matcon Flexi-batch Batching system provides automatic preparation of recipe ingredients off-line. Ideal for delivering an accurate and cost effective flexible recipe batching system, whilst reducing the time-consuming weighing processes and minimising the risk of human error. Automate the preparation of batch ingredients from 10-1000kg with a programmable batching system. Reduce the risk of human error in preparing batching quantities. Reduce the amount of operator time needed to create batches. Give full batch traceability & security. Enable multiple recipes to be handled simultaneously as the system is fully contained. Matcon supply a range of different batching systems to accommodate a wide diversity of dosing ranges. The design of the Formulation System is dependent upon the throughput rates, number of raw ingredients involved and accuracy levels required. The Matcon IBC blending module eliminates the time-consuming cleaning associated with traditional static mixers such as ribbon blenders or cone blenders. As product is blended within the IBC itself the Blender is considered to be a �non-contact� part requiring no cleaning between recipe changes. Tumble-blending on a 360� asymmetric axis to produce a homogenous mix directly within a Matcon IBC. Rapid batch changeovers as there is no cleaning between recipes. Any recipe mixed, at any time. No risk of cross-contamination as the recipe is fully contained within the IBC, unlike ribbon blenders which need a full clean-down between recipes. High OEE as IBCs are prepared and discharged separately from the blending process, minimising the time for loading and unloading the Blender compared to a ribbon blender or other fixed mixer. Additional Intensifier available to provide High Shear blending where necessary to expand the blending capability for liquid additions. 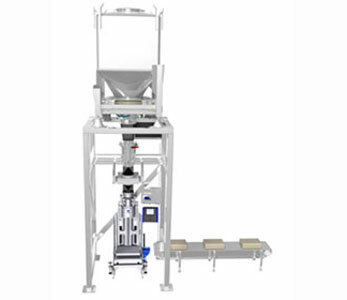 The Matcon Powder Packer module compares favourably for performance with the auger filler packing systems. Change recipes faster than ever before with direct dosing from the Matcon IBC and using simple change out parts. Filling sacks directly from Matcon IBCs without the need for any additional feeders or control mechanisms. Protecting against product segregation during the packing operation, ensuring a quality product in the pack to your customer. Reducing recipe changeover down-time as there is less to clean and the parts are easy to strip and clean. Small campaign runs & 'make-to-order'. 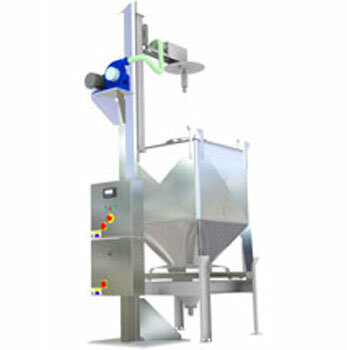 Adjustable and controlled feed, for filling bags from 5 to 30 kg at a rate of 1-3 bags/minute. Spare change-out parts available to reduce cleaning down-time. Quality assurance from optional sifting & metal detection. 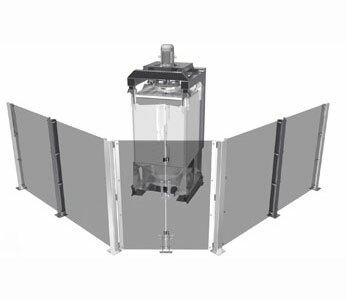 Designed for discharging IBCs directly to high speed packing lines without the need for additional screw feeders. Because the discharge is automatically regulated, and delivers a consistent, controlled feed, the packing machines are able to operate efficiently, thereby maximising their throughput. Protecting against product segregation for a quality product in the final pack. 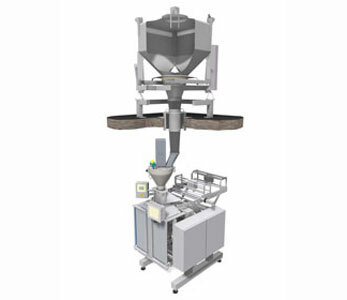 Consistent, controlled feed enabling packing lines to maximise throughput without the use of screw feeders. Prevents choking or head-load variation. Helps reduce changeover down-time as the system is decoupled for maximum flexibility. Automatic control, the discharge process responds to signals from a level probe in the packing line feed hopper. Controlled flow of powder, there is no risk of flushing or bridging in the IBC even without screw feeders. The IBCs are designed to be washed off-line, thereby reducing cleaning down-time. We supply washing systems that are suitable for a food grade IBC through to pharmaceutical applications. We also have a range of solutions from simple manual operations to fully automated wet & dry washing stations. A Manual Wash Lid & Lance (slave lid) - high pressure jets spray water in a controlled and repeatable pattern. 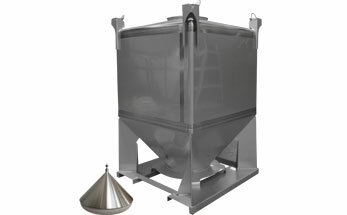 A Wet Wash Station provides a complete inside wash and dry without removing the IBC Cone Calve. Drainage frame incorporating a 'cone lifter' to enable the outlet to be cleaned. Automatic or manual wash lance operation. A complementary Service Skid incorporating various options. Typical wash and dry cycle 20 - 30 minutes depending on material. Using pressurised air supplied through a lance & nozzle arrangement. Removes particles of powder dust and residue. 'Waste' collected in dust extraction unit. Typical wash cycle takes 6-10 minutes depending on material. Clean in Place Discharge Station Wash hood. Cleans the internal surface of discharge station hoppers without needing to remove them. Smart and practical solutions for COP also available.